I have a series of posts going on using the vibration frequency of a tripod to measure the stiffness and damping characteristics. I am now going to lay the groundwork for a related but different type of test, the deflection test. I have found this test used, albeit somewhat dubiously, by one tripod manufacturer. The basic idea is to mount a laser on top of the tripod, apply some torque about the apex by adding some cantilevered weight, and then measure how much the laser is deflected. We will be using the angular version of the spring equation to extract our measure of stiffness. where is the angular deviation measured by the laser and is the amount of the cantilevered weight placed at a distance from the center of the tripod. is the spring constant for stiffness that we are going to measure. This is the same that we measured by observing the oscillation frequency. The tripod shown is a Really Right Stuff TFC-14 with a Feisol PB-70 panning base mounted between the tripod and the camera bar. 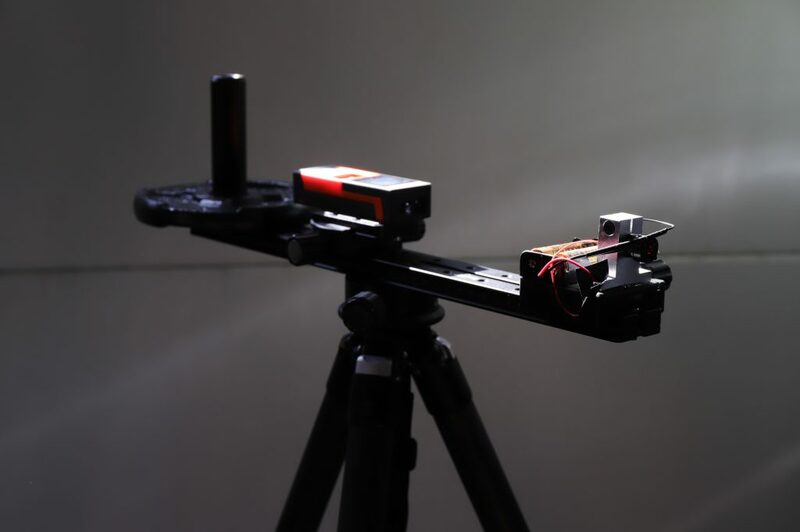 Closest is the laser used for measuring the deflection, in the middle is a laser distance meter, and on the back of the camera bar is a one inch pole with a single 2.5 lb weight. This is a pretty basic setup, and could easily be reproduced at minimum cost. This is all that is involved. In the next post, we will look at the results of a deflection test and discuss the usefulness of this technique.